The week started with Fishou playing the qualifier for the Wild Open tournament. Only 2 of the remaining players had the opportunity to gain a ticket for California and the most prestigious Wild tournament. 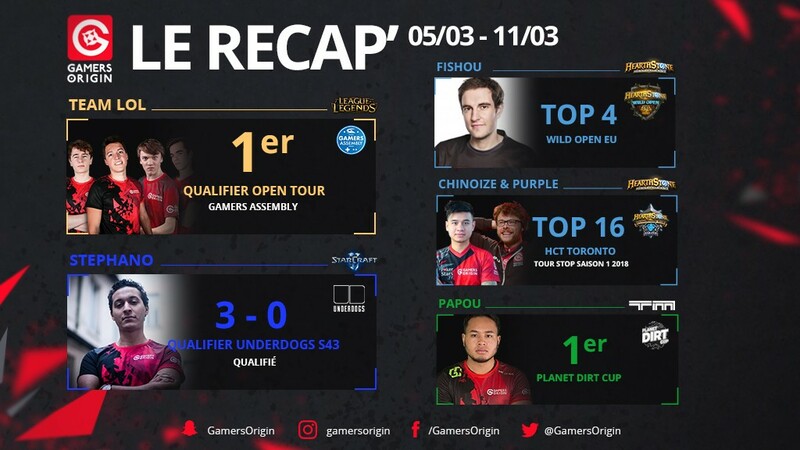 He managed to win his first match 3 – 2 against Scruffy with a remarquable play where Fishou used his own hero power against himself to prevent his Ice Block to proc at 1. Unfortunately it wasn’t enough to achieve a top 2 and Fishou lost against AlexMM 3 to 2 during the decisive BO5. In the meantime, Un33d, Chinoize and Purple went to Toronto, Canada, to take part in a HCT Tour Stop 7-round Swiss-system tournament with the top 8 moving to a single elimination bracket. Purple and Chinoize achieved a top 16 and claimed 100$ and 6 HCT points while Un33d didn’t make it to the top 32. Concerning Starcraft II, Stephano managed to qualify for the 43th season of O’Gaming Underdogs, a well-known French competition. His games will be broadcasted on the O’Gaming Twitch channel very soon. Our PUBG team finished this GLL week at the 10th rank and is preparing for the return of PUBG online and APL due to the end of IEM Katowice. Papou played a lot of TrackMania this weekend and went through the whole bracket to the grand final of Planet Dirt Cup. He won the event by winning 12/13 rounds in the final – a good omen for the upcoming Gamers Assembly! The 2018 Gamers Assembly qualifier for the LoL Open Tour was played this Sunday. Our LoL players defeated five teams in a row, including Made in France, which kicked us from the winner bracket of Lyon Esport. Our boys played wery well during the final against Vitality Academy. They took the first place and the first seed for Gamers Assembly #GOWIN !